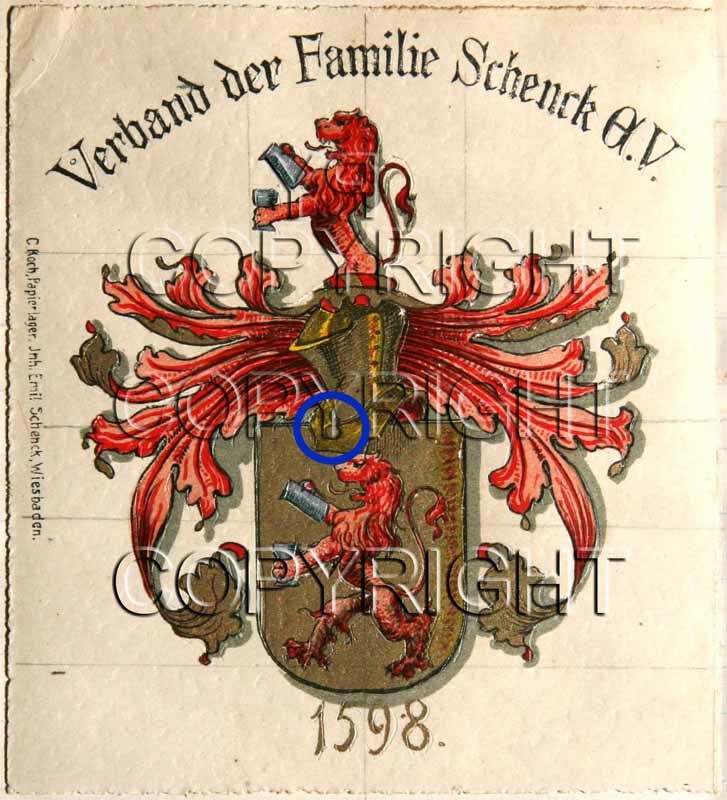 I am in the process of translating a Latin/German Coat of Arms Decree that was written in 1598. 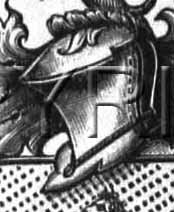 I'm am wondering if anyone has come across the term "klainet" in relation to arms, shields, or any other related armoury research. I don't know what it means and I'm hoping someone can help me with this. I am by no means a linguist, but i did a quick google research to see what would pop up. Since the word is a little removed from modern German, i looked for complete sentences, so i could guess the meaning. "Kleines" means small, as in "small girl" (Kleines Mädchen). A "Kleinod" is a small, in most cases valuable thing, that is valued, but not just by its monetary worth. Your wedding ring could be called a "Kleinod". Do you have it in a compete sentence? That might help. I'll see if i can dig up a bit more. Thanks for your response. 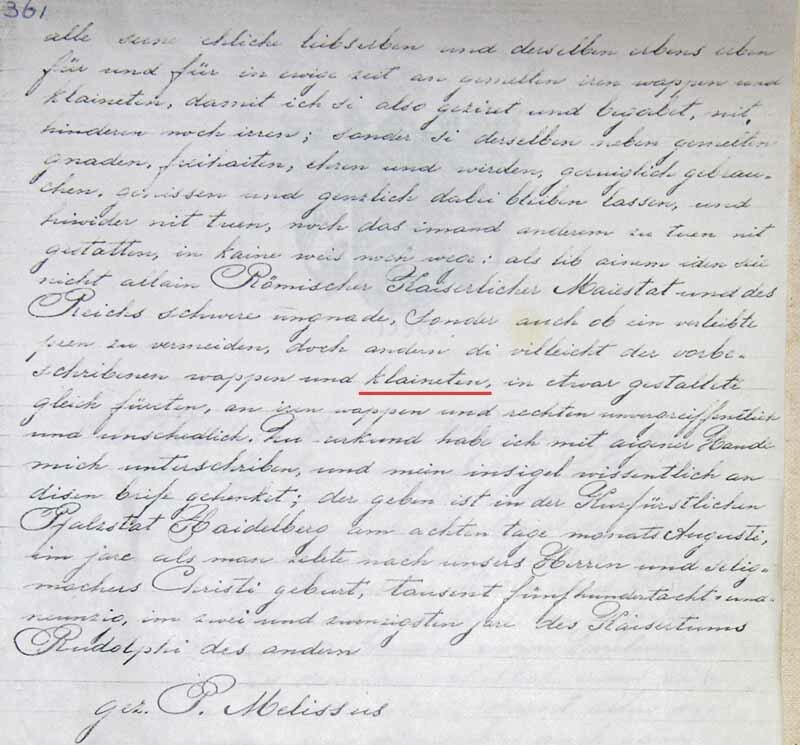 The word appears in two places in the 4 page handwritten copy of the Wappenbrief (decree that accompanies the Coat of Arms). The handwritten version was most likely copied from the original by my great grandmother in the late 1800s. The photo I took of the first instance is too blurry to post, but the word also appears on the last page. The Wappenbrief was granted by Emperor Rudolph ll. Later today I hope to have some of the translation posted online ... I'll forward a link if I get done. It was fun looking for it. I wanted to update the information that I've come across regarding klainet in the context of the Coat of Arms. 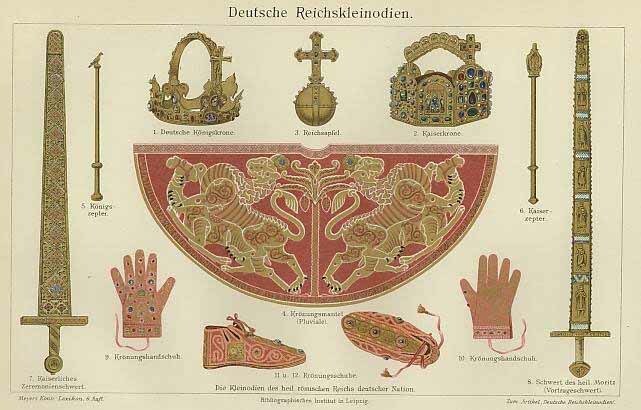 It seems to be the thing that is hanging around the neck of the helmut in the coat of arms. It appears somewhat like a medallion, but with further research in a Dutch Encyclopedia about coat of arms, it's described as precious gem that is worn around the neck. I put a blue circle around it, as it's difficult to see. The watercolour illustration is from about 1840, the B/W image is from 1905 official documents.